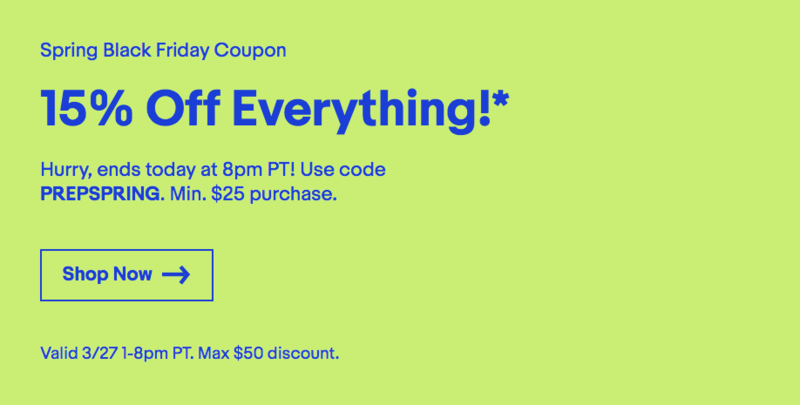 eBay's been offering a ton of sitewide discounts lately, with two codes (one 20% and one 15%) already shared earlier this month. Now eBay is taking 15% off anything on its site yet again, and the discount is capped at $50 just as it was last time. Hurry, though; the offer ends in about six hours. Bear in mind that you can't redeem this on anything from the coins/money category, gift cards, or real estate (yes, eBay lets you sell real estate). You can only use it once, so choose wisely. The code expires at 8pm PT (11pm ET), so don't wait up.